We just watched our crewmates Dan Burbank, Anton Shkaplerov and Anatoly Ivanishin blast off from the snowy steppes of Baikonur Cosmodrome in Kazakhstan. They are a little later than originally scheduled, but it amazes me that they were cleared for launch so soon after the failure of the Soyuz booster during the Progress cargo launch in August. This is a real credit to the primarily Russian team who were able to deduce the cause and execute a plan for moving forward so quickly. I have to admit I wasn’t sure back in August we would be here to greet them on the other side of the hatch. This sets in motion a rapid-fire chain of events which will take place over the next week. After their arrival in almost exactly 2 days, we will have only 4 full days to pass on as much as possible before it’s time for us to climb aboard our Soyuz spacecraft for the ride home. We spent a lot of time over the weekend packing and preparing for their arrival. There are no happier human beings in the universe right now than Anton and Anatoly who have now realized their dream about launching into space. I wish I could see the look on their faces as they experience weightlessness and get their first look at our beautiful planet rolling by outside their windows right now. 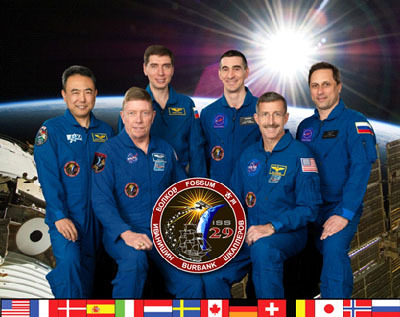 In short, it looks like Expedition 29 will have a full crew of 6 for a few days before I hand the reins to the new Commander, Dan Burbank, as we depart and Expedition 30 begins. Our time up here draws to a close and I’m going to make the best of every remaining minute!